If you know me – either in real life or just through my activities online – you’ll be aware (possibly to the point of exasperation) that I’m obsessed with archaeology. You’ll probably also know that my main area of interest is Irish archaeology, especially prehistory, the Early Christian period, and post-Medieval gravestones – it’s just how I am! What fewer of you may know is that I’m also pretty obsessed with Egypt and Egyptology! What almost no one knows is that my family and I are the curators of a small collection of ancient Egyptian artefacts. I say curators, rather than owners, as we believe that we can never truly own such items – we are merely their custodians for the next generation. The collection was passed to me contained in a small Godfrey Phillips tobacco tin (Fig. 1). I remember clearly the morning when I first opened the lid of that box. In its own small way, it was quite like Howard Carter’s statement on opening the tomb of Tutankhamun and seeing ‘wonderful things’. There may not have been ‘everywhere the glint of gold’, but I was quite taken aback (Fig. 2). Unfortunately, the finds are without any real provenance. The only consensus we can come to within the family is that they were probably purchased in England as part of a job lot at a house clearance sale during the 1960s or 1970s. Regrettably, this is the extent of our knowledge on where they came from – and this is mostly speculation! Figure 1. The Godfrey Phillip’s tobacco box. Godfrey Phillips Ltd. introduced the B. D. V. brand of cigarettes in the early 1900s. Although popular for some time, the line was finally discontinued in 1948. Within this time frame, the style of the box may be more closely dated to the late 1920s to early 1930s (pers. comm. Lee Towersey). Although not conclusive, this does provide a suggestion as to when the collection was boxed up in its present form. However, the presence of various plaques/amulets with ‘X-decoration’ (see below) may be paralleled on strings of beads made up for the Victorian tourist market (Dr. A. Cooke pers. comm.). As such artefacts are not thought to have been recovered from excavated contexts, it may be that they are ‘fakes’ to fool the tourists and enliven an otherwise ‘dull’ collection of faience beads. While disappointing to those seeking Egyptian antiquities, it may be a reliable pointer as to when the genuine items were discovered, sold and transported out of Egypt. Figure 2. The contents of the box as I first discovered them. 1) To make the collection know on its own merits to the widest audience – both scholarly and amateur. 2) To invite collaboration in adding detail or correcting inaccuracies in the descriptions. Please feel free to comment directly to the blog or contact me by email. In so far as possible, I will endeavour to make changes to the text and formally acknowledge any contributions made. 3) I would love to think that this post may act as an inspiration to others to make the collections curated by them and their families better known and available to a wider audience. If you have inherited (and are in legal possession of) antiquities (of any culture, not just Egyptian) and would like to see them enjoyed by both specialists and enthusiasts across the globe, please consider photographing and writing them up. If anyone needs a platform to present their results, please consider submitting them here as a guest writer on this blog! Figure 3. Necklace composed of faience beads. Composed of 82 lenticular/disc beads, apparently of blue faience. Arranged in size to form a symmetrical composition. The largest bead, at the approximate centre of the composition, measures 16.29mm in diameter, decreasing to 9.71mm in diameter near the ends. The design is augmented with a further 36 flat blue faience beads (on the left of Fig. 3). These too are arranged from largest (6.04mm in diameter) to smallest (2.12mm in diameter). At the point where a modern necklace would have a clasp there is a small scarab bead/amulet (10.40mm x 7.76mm x 5.81mm) and a lozenge-shaped pendant (27.73mm x 7.65mm x 3.17mm) also in blue faience. The beads show a variety of different types of wear and attrition patterns and appear to be derived from a number of sources. The whole composition is strung on what appears to be modern linen thread. A small paper tag is attached to the necklace by thin thread. The label is written in ink and reads: “Egyptian XXVI Dynasty circa 600 BC. Found Thebes”. Current theories on dating the Egyptian chronology would place the 26th (Saite) Dynasty, in the period from 664-525 BC. However, such lenticular/disc beads were very popular throughout the New Kingdom and may be dated to a significantly earlier period (1550-1069 BC) (pers. comm. Dr. A. Cooke; Brovarski et al. 1982, 238-9). It may be supposed that, rather than being an intact original collection, the composition was put together from a number of sources, presumably to make it more attractive to a prospective buyer. This appears to be two, highly tangled, strings of beads. One (largely on the left of Fig. 4) is composed of a large number of ‘flat’ or plain beads of various types and colours, interspersed with occasional tubular beads of faience. The second necklace (mostly in the top right of fig. 4) is chiefly composed of blue faience tubular beads with occasional ‘flat’ or plain beads interspersed. The majority of the tubular beads are plain, but some segmented examples are also present. The ‘flat’ beads are present in a variety of colours, including shades of blue, yellow, red, and also black. Both necklaces there are interspersed with larger beads/amulets, which are described in more detail below. Both necklaces appear to be strung on modern linen thread, suggesting that they were not originally part of a single artifact, but have been assembled, presumably to make them more saleable. A small paper label, now detached, may originally have been associated with either or both of these pieces. It is identical to the one detailed above. The various components of the necklaces are listed individually, below. Figure 4. Two tangled necklaces with various large beads/amulets. Figure 5. Underside of scarab with possible ‘Ra’ hieroglyph. Underside stamped with possible hieroglyphic text. Circular indentation may be translated as ‘Ra’, while the linked lozenge shapes on either side appear to be a ‘Ka’. Together these may be read as ‘Ka-Ra’: the vital essence (soul) of Ra. Dr. A. Cooke (pers. comm.) suggests that the lozenges may be better interpreted as two crocodiles. Figure 6. Small amulet possibly depicting a deity. This is a small and roughly-made faience amulet. It is possible to interpret it as a representation of the goddess Taweret, associated with childbirth and fertility. However, the level of craftsmanship is such that any one of a number of interpretations is possible. Figure 7. Small sub-oval amulet/plaque. Small sub-oval amulet/plaque. Five impressed lines on one flat surface produced a hatched X-decoration. The opposite flat surface is decorated in the same manner, but with four lines used to create the X. Edges are decorated with vertical incised lines to create a scalloped effect. Dr. A. Cooke (pers. comm.) has noted that the various small amulets/plaques in this collection are apparently unknown from excavated contexts, but are relatively common components of strings of beads put together for the tourist market during the Victorian period. While the may not be genuine, they do serve to give a likely date for when the collection was put together for sale and exported from Egypt. Sub-rectangular amulet/plaque. Both flat sides are decorated with four impressed lines to produce a hatched X-decoration. Edges are decorated with vertical incised lines to create a scalloped effect. Possibly fake (see entry for Fig. 7). Figure 9. Upper surface of small scarab amulet. Figure 10. Underside of small scarab amulet with hieroglyphic inscription possibly to the sun god, Ra. Underside is decorated with rough hieroglyph of seated/kneeling human form and an incised dot. The text may be interpreted as the name of the sun god, Ra, with the seated figure intended as a determinative symbol to ensure that the meaning referred to the god as opposed to the actual sun. The text is enclosed within an impressed cartouche-like oval. Dr. A. Cooke (pers. comm.) suggests that the seated figure could be a baboon. A number of deities in the Egyptian pantheon were depicted as a baboon, most notably Thoth. Figure 11. Wedjat/Eye of Horus. Finely-made Wedjat, representing the right eye, decorated with fine impressed lines. The only significant damage to the artefact is that the vertical stave beneath the pupil is broken and missing. The back is left blank. Figure 12. Upper surface of pierced/open work bead/amulet. Large bead or small amulet with five linear perforations running the length of the body. Either end is decorated with a series of vertical incised lines to create a scalloped effect. The upper surface (pictured) is slightly domed, or convex, while the underside is flat. Dr. A. Cooke (pers. comm.) suggests that the decorative intention may have been to portray a group of wedjat eyes. Disc or bead possibly made of faience or pottery. Un-fused surfaces, present from the time of moulding, are visible. Figure 15. Hemispherical seal amulet. Hemispherical bead/amulet with plain (curved) back. Flat surface is decorated with four impressed lines in the form of a cross with a raised central boss. The intervening angles are each decorated with two lightly-impressed lines with curling ends. The whole gives the impression of a stylised flower motif. Dr. A. Cooke (pers. comm.) notes that this example compares well with a plain scarab illustrated by Flinders Petrie (1925, Pl. VIII, no. 276, 16). The type is dated to the New Kingdom (1550-1069 BC) and later. The collection also includes a small number of beads/amulets not worked into necklace forms. These are described and illustrated below. Figure 16. Amulet, possibly of the god Pataikos. Small amulet depicting the naked dwarf deity, Pataikos. Pataikos was associated with Ptah of Memphis, and was an apotropaic god in his own right. This amulet had a pronounced lug at the back of the neck for suspension and a pronounced naval, or omphalos. The amulet appears to have been broken at the knees in antiquity. 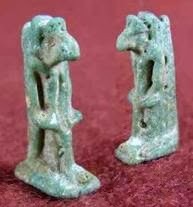 Although crudely produced amulets of this type appear in the late Old Kingdom (2345-2181 BC), it is not until the New Kingdom (1550-1069 BC) that clearly detailed examples are found. Dr. A. Cooke (pers. comm.) suggests that this example is likely to date from the Third Intermediate Period (1069-656 BC) or later. Figure 17. Large faience bead. Large, near spherical bead, probably of faience. Figure 18. Possible Sphinx amulet. Small, crudely-made, amulet, apparently of faience. The form is interpreted as a depiction of a sphinx. However, the level of detail is such that a number of interpretations may be equally supported. A hole through the ‘eye’ suggests that it was intended for suspension. Figure 19. Small faience amulet, possibly depicting Taweret. Figure 20. Small faience amulet, possibly depicting Taweret. 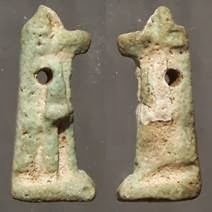 This is a small and crudely-executed faience amulet. Similar to the example detailed above (Fig. 6), it is possible the interpret the deity depicted in numerous ways, including as Taweret. Although the level of detail is minimal, it does appear that, in common with many amulets, the deity is depicted as having the left foot ahead of the right. Dr. A. Cooke (pers. comm.) suggests that the amulet may equally be interpreted as depicting a jackal-headed deity, such as Anubis, or Duamutef. There is a piercing in the back plate for suspension. Sub-rectangular amulet/plaque with rounded corners. Both flat sides are decorated with four impressed lines to produce a hatched X-decoration. Unlike similar amulets described in this catalogue, the edges are smooth. Possibly fake (see entry for Fig. 7). I would like to take this opportunity to thank Mr. Lee Towersey (http://www.cigarettecards.co.uk/) for his assistance in dating the Godfrey Philips cigarette box. Much assistance was given on all things Egyptological (and gratefully accepted) by Dr. Ashley Cooke, Head of Antiquities & Curator of Egyptology, National Museums Liverpool. I would also like to thank Prof. Maria Helena Trindade Lopes, Professor Catedrático na Faculdade de Ciências Sociais e Humanas da Universidade Nova de Lisboa, Portugal. Brovarski, E., Doll, S. K., & Freed, R. E. (eds.) 1982 Egypt’s Golden Age: The art of living in the New Kingdom 1558-1085 BC. Boston. Flinders Petrie, W. M. 1925 Buttons and Design Scarabs. London. There are various schools of thought as to the derivation of the Godfrey Phillips monogram ‘B. D. V.’. One theory suggests that it derives from Boyd & Dibrell, Virginia, the U.S. suppliers of the tobacco. Another possibility, apparently given by a member of the Phillips family during a court case, is that they are an abbreviation for the Latin phrase Benedictus dominus vobiscum, meaning ‘pipe of peace’ (http://www.oldshopstuff.com/SallesdeChat/tabid/1803/aft/533/Default.aspx. 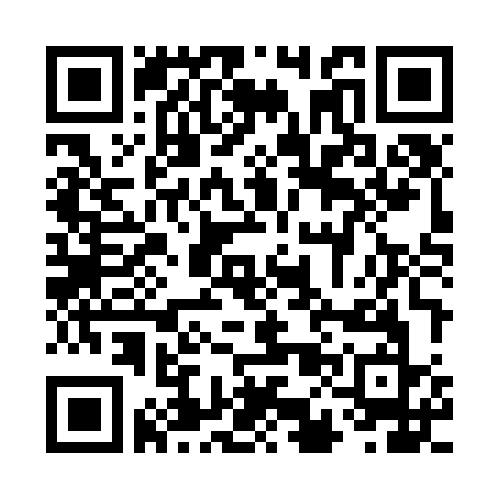 Accessed 17 February 2012). A little while ago I received an email from Dr Bron Lipkin of Collector Antiquities, who wished to add some notes to the above post. Additional photos are supplied by Dr. Lipkin. Fig. 6: Difficult to decide but one does see very rudimentary small somewhat angular amulets of Ptaikos. Figs. 9 & 10: All in all I think it’s rather likely that this one is a fake actually. I base my opinion not only on the motif but the cutting style as well. This is the only piece in your little box of treasures which I think is not ancient. Fig. 12: Yes, a multiple Wedjat eye amulet: they come in various forms. Fig. 18: An ithyphallic amulet. Figs. 19 & 20: Either Anubis (first two) or Thoth (last photo) as an ibis heasded figure: difficult as the front of the “nose” has been rubbed away. The two tangled necklaces with various beads and amulets would have been put together and restrung in modern times. In 1979 the Egyptian Museum in Cairo was selling such 'mummy beads', both long and short, by the kilogram to dealers and Jewelry makers. I teamed up with a fellow archaeologist at the time in Toronto, Ontario, Canada, and we strung together and sold hundreds such genuine faience bead necklaces with or without additional beads. Most surprisingly, the reason why there are so many mummy beads in existence is because these were strung into large 'nets' to cover the entire mummy before it was placed in a sarcophagus. The very reason these are called 'mummy beads" is because they came from mummies, never actually worn as necklaces in ancient Egypt. I still have one or two necklaces myself, including a few beads and amulets from those years when the Tutankhamun Exhibit toured North America.